Dragon awakens after his near drowning and discovers that he has been taken to a zoo of some kind within the kingdom of Atlantis. He is trapped in a chamber with a number of other humans and freaks, on show to anyone curious enough to check out their habitat. Dragon is approached by a guard that is wearing a suit filled with water. This figure explains that they had found him floating near their territory and brought him to where he could breathe again. A number of questions are asked of this new prisoner regarding his origins but Dragon has to confess that he has literally no idea where he hails from. He requests that he be returned to the surface so that he can locate his friends and family but is informed that he must remain incarcerated for the rest of his life. The Atlantean has decreed that his people remain hidden from the world above so that they avoid the same destruction that has befallen humanity. He has had the monstrous Grokk species dig tunnels between every major body of water throughout the world to unite the whole undersea world and as such, people such as Dragon cannot be permitted to leave and potentially expose their existence. Dragon does not take this revelation well and he knocks out the guard, drawing the attention of numerous other armed men. He delivers a thunderous punch that takes out the entire enemy force before addressing his fellow captives. Dragon instructs them to each remove a guard’s water-suit and empty it out so that they can fill them with air and use them to escape. These men and women refuse as they feel sheltered in Atlantis and do not have to fear aliens, Gods and monsters as they would on the surface. A fortified door suddenly cuts Dragon off from his cellmates and a powerful gas is pumped into the chamber which soon renders him unconscious. He awakens some time later in the throne room of the Atlantean who listens to his pleas to be released up top. The Atlantean explains all about his desire for secrecy before being joined by a face familiar to Dragon. Mako has seemingly abandoned the world above and has become assimilated into life in Atlantis. He warns that Dragon should not be returned to the zoo as he will not rest until he has escaped and instead recommends he be put to work. The Atlantean agrees to this advice and orders that Dragon be sentenced to hard labor to tire him out. Dragon soon finds himself locked up in a chain gang working in the Bay of Bones where they are clearing away debris created by the Grokks as they dig the vacuum tunnels. One of the captives starts to freak out about how the tunnels are weakening the structure of the Earth and will doom the planet. He is dealt with by the guards but some of the prisoners come up with an idea. Gator recognises Dragon as a former police officer and suggests to Man-Eater to use her telepathy to have the hero start a riot. Unfortunately for the villains, Man-Eater’s abilities are not strong enough to work on Dragon’s unique physiology and he shrugs off her commands. This prompts Gator to take a more direct action by starting a fight with him. As a number of guards try to break up the violence, the super-powered combatants end up damaging one of the walls. The barrier soon collapses and releases the long-incarcerated race of volcanic creatures known as the Lava Lords. All-out chaos ignites as the Lava Lords seek revenge upon their former captors but the Atlantean soon arrives on the scene with reinforcements. He uses his horn to command the Grokks and unleashes them upon the escaped prisoners. Dragon takes the opportunity to flee but is alarmed when Mako swims towards him and barely misses him. The hero prepares for his old foe to turn around for another attack but instead witnesses Mako move directly for the Atlantean. He bites off the monarch’s head and tosses his corpse towards the Lava Lords who incinerate the carcass. Dragon is left terrified as Mako turns his attention to him but has other things to worry about when one of the Grokks targets him. He swims as fast as possible away but is pleasantly surprised when the monster pursuing stops. 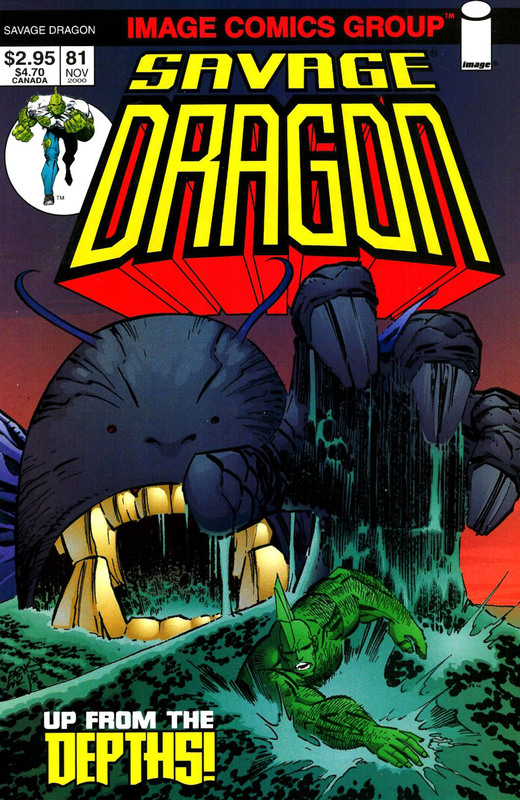 Dragon assumes that it turned its attention towards Mako, unaware that the villain had actually attacked the Grokk to enable Dragon to escape. Dragon finally reaches the surface where he crawls up onto a rocky beach before collapsing from exhaustion.